The geospatial pioneers at Esri have revised and expanded this learn-by-doing guide to ArcGIS. 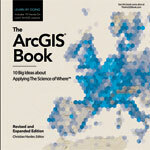 Not just something to read, The ArcGIS Book: 10 Big Ideas about Applying The Science of Where offers GIS-based activities that readers can do in tandem with its website, TheArcGISBook.com. Investigate hundreds of live maps, then use your free Learn ArcGIS student account to create content about issues that matter to you and share the analytical results online as Esri Story Maps apps, web maps, mobile apps, and 3D scenes. By the end of the book, readers will have mapped the demographics of Detroit, modeled the habitat of mountain lions in Los Angeles County, and created an underwater 3D scene off the coast of Florida. Summer 2017, 172 pp. Paperback ISBN: 9781589484870. 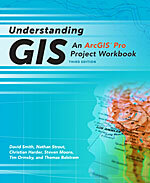 The first single-project GIS textbook on the market, Understanding GIS: An ArcGIS Pro Project Workbook is an excellent resource for students and educators seeking a guide for an advanced, single-project-based course that incorporates GIS across a wide range of disciplines. In this third edition of Understanding GIS, readers progress through nine lessons (35 exercises), using ArcGIS Pro to find the best location for a new park along the Los Angeles River in Southern California. Each exercise offers step-by-step instructions, graphics to confirm exercise results, and explanations of key concepts. 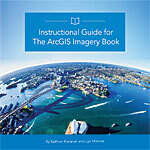 The book gives readers access to ArcGIS Desktop software, including ArcGIS Pro. Project data—which is real and updated—can be downloaded from the book's resource web page. Fall 2017, 360 pp. E-book ISBN: 9781589484955, and paperback ISBN: 9781589484832. 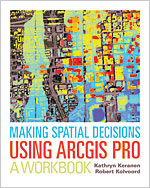 With lessons adapted from the authors' popular Making Spatial Decisions series and updated for ArcGIS Pro, readers of the new Making Spatial Decisions Using ArcGIS Pro: A Workbook get to solve real-world problems using the full range of capabilities of ArcGIS Pro. This textbook takes advantage of the integrative nature of ArcGIS software to seamlessly unite cloud-based, online, and desktop GIS. Kathryn Keranen and Robert Kolvoord use proven teaching methods so students can immediately apply what they learn as they progress through the workbook lessons. Scenarios include emergency hazards, natural disasters, social trends, law enforcement, and urban development. Summer 2017, 290 pp. E-book ISBN: 97815894844856, and paperback ISBN: 9781589484849. Imagery and GIS: Best Practices for Extracting Information from Imagery demonstrates how to successfully integrate imagery into maps and GIS projects. Readers will learn how GIS can derive value from imagery by extracting and analyzing information and providing enhanced visualizations, as well as how to efficiently manage and serve imagery datasets. With more than 150 full-color illustrations, this reference guide helps practitioners use image datasets that best satisfy their own requirements. Fall 2017, 400 pp. E-book ISBN: 9781589484894, and paperback ISBN: 9781589484542. 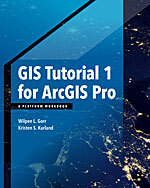 GIS Tutorial 1 for ArcGIS Pro: A Platform Workbook is an introductory text for learning ArcGIS Pro, Esri's premier professional desktop GIS app. In-depth exercises that use ArcGIS Pro, ArcGIS Online, and other ArcGIS apps feature the latest GIS technology and show readers how to make maps, create and analyze spatial data, and manage systems with GIS. The authors incorporate proven teaching methods into detailed exercises, "Your Turn" sections, and expanded homework assignments, making this book well suited to students learning GIS in a classroom setting. Resources for instructors are available upon request. Fall 2017, 650 pp. E-book ISBN: 9781589484931, and paperback ISBN: 9781589484665. This complimentary online companion to The ArcGIS Imagery Book: New View, New Vision (Esri Press 2016) gives self-learners and current or future GIS instructors the materials they need to develop and apply ArcGIS imagery tools and concepts. 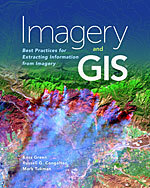 Building on the foundational ideas laid out in The ArcGIS Imagery Book and using its structure as a starting point, each chapter in this instructional guide provides students and teachers with activities, resources, lessons, and data that reveal how different components of ArcGIS Online interact with each other, as well as with GIS apps for publishing to the web and mobile devices. A combination of scenario-driven and skills-based lessons—including many that don't require software downloads—lets readers practice using these tools and inspires a deeper understanding of the potential and power of enterprise GIS.